Executives have welcomed signs that change is afoot in Saudi Arabia, although many are also keen for the pace of economic reforms to be accelerated, a new survey by the Oxford Business Group finds. As part of its second survey on the Kingdom, the global research and consultancy firm asked over 100 C-suite executives from across Saudi Arabia’s industries a wide-ranging series of questions on a face-to-face basis aimed at gauging business sentiment. 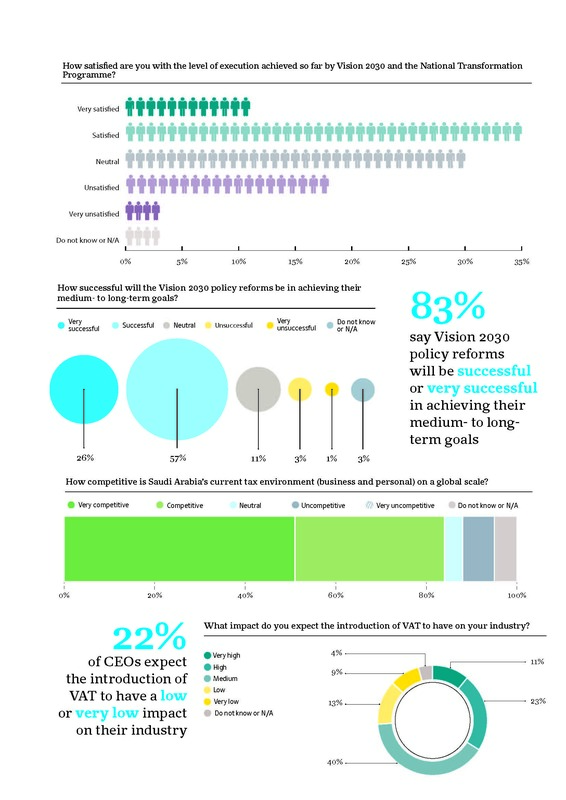 In a key finding, 72% of respondents described collaboration between the private and public sectors – a lynchpin of Vision 2030 – as either improving or definitely improving. Business leaders interviewed were also confident about the areas of the economy that they felt would drive non-oil growth in the short to medium term, with tourism and mining top of the list, garnering 14% and 12% of the share respectively, followed by manufacturing and healthcare. In comparison to CEOs of larger companies, those of small and medium-sized enterprises (SMEs) – companies with 750 employees or less – are more optimistic, OBG finds. Sentiment among those interviewed was largely upbeat, with 72% describing their expectations for local business conditions in the coming 12 months as positive or very positive, up by two percentage points on last year’s results, which were published in June. An even higher share (75%) said they were likely or very likely to make a significant capital investment in the next 12 months. Confidence was especially high among smaller businesses, a segment of the economy which is being primed for development under Vision 2030. There were signs that executives would like to see reforms move more quickly, however, with less than half (46%) saying they were satisfied or very satisfied with the level of execution achieved so far by national initiatives. 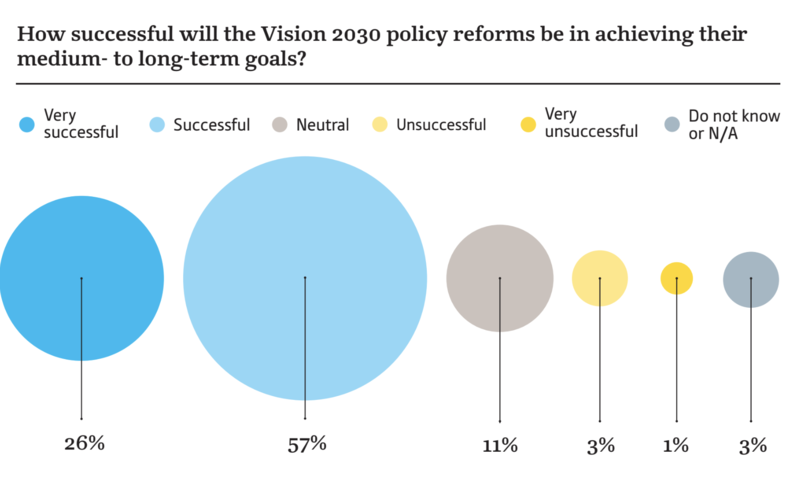 Nevertheless, while not fully satisfied by the tempo of change, most business leaders interviewed (83%) were confident that the policy reforms earmarked for implementation or already under way would meet their targets over time. The share of respondents viewing Saudi Arabia’s personal and corporate tax environment as competitive or very competitive on a global scale remained high (84%), but was down by 10 percentage points on the findings in OBG’s previous survey, perhaps because of the introduction of measures such as the 5% value-added tax (VAT) and new labour fees. Asked specifically about the impact of VAT on their business, the largest share of those interviewed (40%) said they felt the effect on their industry would be moderate, rather than high/very high (34%) or low/very low (22%). Commenting in his blog, Oliver Cornock, OBG’s editor-in-chief and managing editor for the Middle East, said the findings indicated that it was taking time for policy changes, particularly those directed towards the private sector, to have an effect. While responses about VAT – a new concept for businesses in the Kingdom – and its impact across the economic sectors were mixed, Cornock said the message from many CEOs interviewed was that they were willing to manage the immediate pain of these and other measures, provided the reforms expected to bring long-term gain are speeded up. Cornock’s in-depth evaluation of the survey’s results can be found on OBG’s Editor’s Blog, titled ‘Next Frontier’. All four of OBG’s regional managing editors use the platform to share their expert analysis of the latest developments taking place across the sectors of the 30+ high-growth markets covered by the company’s research. The OBG Business Barometer: CEO Surveys features in the Group’s extensive portfolio of research tools. The full results of the survey on Saudi Arabia will be made available online and in print. Similar studies are also under way in the other markets in which OBG operates.